A few months ago, the artists in my building (Pink Dog Creative) on Depot Street in Asheville's River Arts District were asked to consider being a part of an art exhibit which would correspond with the 2018 meeting of ClimateCon, a collaborative gathering of business and science professionals who come together to advance the development of data-driven products and services. This year's meeting is in Asheville (for more info, check out climatecon.com). So, in thinking about the task of creating a piece of artwork that has something to do with the environment was somewhat challenging. My artwork is nature landscapes mostly so you could say that ALL my artwork has to do with the environment. But I wanted to try something different (because that's more fun). So I was looking on line at "climate change photos" and I saw a photo of a glacier with some craggy mountains and blue sky in the background. I loved the blues in the ice. It almost looked like an abstract painting. So...there was my idea. 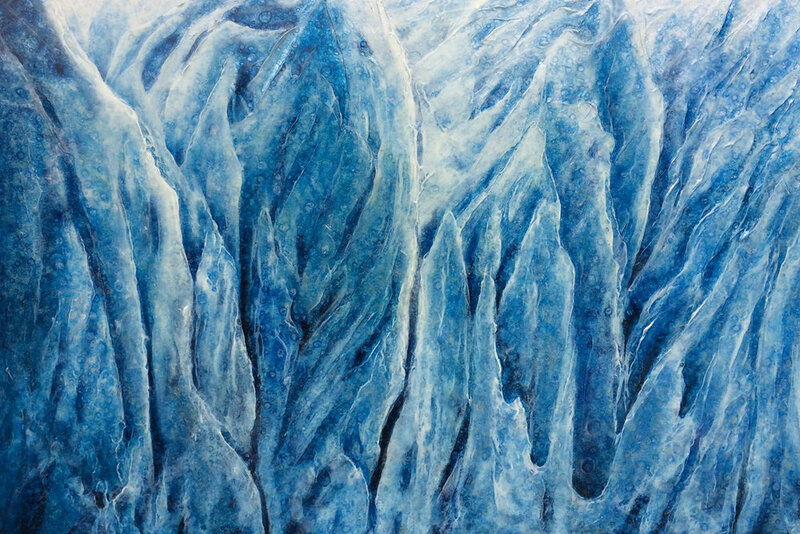 I painted a glacier. I cut out the mountains and sky and just focused on the ice. And I had a blast. Arctic sea ice, the layer of frozen seawater covering much of the Arctic Ocean and neighboring seas, is often referred to as the planet’s air conditioner: its white surface bounces solar energy back to space, cooling the globe. The sea ice cap changes with the season, growing in the autumn and winter and shrinking in the spring and summer. Its minimum summertime extent, which typically occurs in September, has been decreasing, overall, at a rapid pace since the late 1970s due to warming temperatures. This year, temperatures in the Arctic have been relatively moderate for such high latitudes, even cooler than average in some regions. Still, the 2017 minimum sea ice extent is 610,000 square miles (1.58 million square kilometers) below the 1981-2010 average minimum extent." So is sea ice growing or shrinking??? GREAT NEWS! So they're not melting AT ALL! The Arctic ice cap melted to hundreds of thousands of square miles below average this summer, according to data released late on Tuesday. So they're melting? Well yes. And no. It turns out the arctic ice cap is melting (you can see satellite images that clearly show the extent). But the antarctic ice cap is growing AND shrinking, but overall growing. "While Arctic ice is melting at a record pace, a team of NASA-led researchers say they can explain why Antarctic sea ice has been edging in the opposite direction. That paradox has puzzled scientists for years and given climate-change deniers fodder to dispute global warming. The group found that the icy winds blowing off Antarctica, as well as a powerful ocean current that circles the frozen continent, are much larger factors in the formation and persistence of Antarctic sea ice than changes in temperature. The mighty Southern Ocean Circumpolar Current prevents warmer ocean water from reaching the Antarctic sea ice zone, helping to isolate the continent. The winds within that ice zone keep the water extremely cold, enabling the sea ice cover to grow in recent years even as global temperatures have risen markedly. The findings are based on satellite readings of Antarctic sea ice movement and thickness, as well as new, detailed interpretations of charts showing the shape of the sea bottom around Antarctica. They were published online this month in the journal Remote Sensing of Environment. Arctic sea ice and glaciers around the world have been dwindling quickly. And scientists have published dire warnings that several ice shelves in West Antarctica are being undermined by warm currents where they connect to the ocean floor. That melting phenomenon is expected to lead to significant, unavoidable sea rise over centuries. So, my glacier painting will most certainly not make the polar ice cap grow rather than shrink. But it might get people thinking, talking and debating. And if that's all a piece of artwork does, well then...I can definitely live with that.